Compact is the new catch phrase that targets buyers looking to upgrade to a larger vehicle but can't quite make the price jump. It's working for manufacturers too with the 'life utility vehicle' (LUV) Ertiga having received over 45,000 bookings in just its first three months. 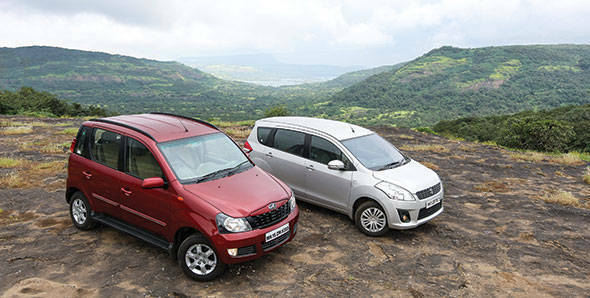 Mahindra now have crashed this compact party with their latest offering - the Quanto. It's the second compact SUV offering, a segment pioneered by the Premier Rio and its already clocking close to 6000 orders in its first month alone. And as you would have read our scoop in the news section, Tata Motors is also preparing to join this party. So pitching these two together would be interesting because its a growing segment but more importantly one thats all new. There arent any benchmarks either and any one of these two could become the all new benchmark for the class. But which is it? With the Maruti Ertiga what you get is understated elegance. It's a design that does not stand out yet keeps the familiar family look with influences from the Ritz and the Swift seen in the front grill and headlamp design. The flared wheel arches give the Ertiga character and it looks sporty and more car like. The rear maintains a clean and uncluttered look with the smallish tail lamps and roof spoiler adding to the sporty, car like look. With the Quanto you get a Xylo that's been to the chop shop. It gets the old Xylo bonnet and the Genio grill which leaves it with an odd body coloured lip over the grill. The rest of the car is much the same as the Xylo except that the boot has been lopped off to bring its length under 4 metres. The all new rear section is quite neat and tidy with small high set tail lamps in the D-pillars. The star of the rear end on the C8 (top of the line) variant is definitely the 'half' spare wheel cover with its brushed aluminium and matte black mix of textures giving it a premium look and the effect does spread out to the rest of the MUV too. The Quanto is very tall and looks like it could lose at least a foot off the top which would help in not just the visual department but its handling as well but more on that later. So the winner by far in the style department is the Ertiga, it is a more cohesive design and looks much seamless in form. And while we have seen Mahindra do some extraordinary design work on the XUV500, that hasnt rubbed off on to the Quanto, pity! The features list in both vehicles are similar both borrowing elements from close family members  the Ertiga from the Swift and the Quanto from the Xylo. The top of the line variants both offer dual air bags, aircon with a blower for the second row and other features that are common in a vehicle at this price point. The Ertiga cabin feels premium and luxurious compared to the Quanto where the poor fit and feel of the plastics can't compare to the quality in the Ertiga. The Quanto cabin does offer more space for the first two rows with more shoulder and head room on offer than the Ertiga, but that's not to say that the first two rows in the Ertiga are cramped. The 60-40 split seats in the second row of the Ertiga in fact are more comfortable, adjusting for tilt, as compared to the rather upright second bench in the Quanto. Both claim to seat seven and they have taken separate roads to achieve this. The Ertiga uses three rows of forward facing seats while the Quanto makes do with jump seats in the boot for its sixth and seventh passenger. Mr Six and Miss Seven are comfortably accommodated in the Ertiga with the second row sliding forward to free up enough room for a short drive around town. In the Quanto their numbers up and unless it's for very short distances your sixth and seventh family members are better off making their own way. It's very cramped in the boot's jump seats and considering that there are no seatbelts, it's not safe either. So the Ertiga edges further ahead in the competition with a highly ergonomic interior. This is where things get interesting with the Ertiga utilizing the tried and tested fiat 1.3 multijet. Mahindra on the other hand have developed a new three clinder version of their mHawk 2.2 litre mill in 1.5 litre configuration to take advantage of the engine size restrictions placed on the compact sub four meter cars. The Ertiga engine makes 90PS and 200Nm and despite the max torque coming in at 1750rpm, while driving around town the engine feels a little sluggish. A lag in the turbo spooling up is clearly felt followed by a surge of power requiring more effort to modulate the throttle to make smooth progress in town. The Quanto's 1.5 mCR100 engine makes 100PS@ and 240Nm and is very refined for a three cylinder configuration with peak torque coming in at a lower 1600rpm. It's a much better engine to drive around town with the twin stage turbo all but eliminating lag in the lower revs. It does however run out of steam quickly and once over 3500rpm it looses grunt and ground to the Ertiga mill which has woken up and is now singing. This is reflected in the performance figures too with the Ertiga besting the Quanto in third gear roll ons (20-80kmph) by over 2 seconds where the Ertiga is able to rev into its sweat spot. But in fifth gear roll ons (40-100kmph) where engine revs are considerably lower the Quanto replies, besting the Ertiga by 7.4s. So while the Ertiga is better at highway cruising, the Quanto is superior when it comes to trudging in city traffic. In outright performance the Ertiga is still the clear winner posting 13.33s to a ton to the Quanto's 16.18s and topping out at 169.13kmph to the Quanto's 144.5kmph max. The Quanto also comes with Mahindra's 'Micro Hybrid' stop-start technology but still cant beat the Ertiga's overall mileage figure of 15.25kmpl, the Quanto only managing 14.03kmpl overall. Where the Quanto loses out to the Ertiga is because of its kerb weight, at 1640 kilos its nearly 400 kilos heavier than the Ertiga. It puts a lot of strain on the Quanto resulting in lesser performance and weaker fuel efficiency. This is were the Ertiga steps away from the stumps and takes a big swing at the Quanto in an attempt to clear the boundary. The basic design of the Ertiga with its 20mm shorter wheel base, monocoque chassis and much lower centre of gravity is a much more planted vehicle on the road. Its car like feel translates to good handling through corners with the steering providing you with ample feedback. The suspension is also slightly softer than the Ritz that it's based on and translates to a plush ride over broken roads with little body roll to upset occupants. The Quanto is a top heavy vehicle with a body-on-ladder design and just can't match the composure of the monocoque Ertiga. It feels vague through corners with a lot of body roll. The ride quality at low speeds is quite good but as speeds increase the suspension allows small imperfections in the road to make their presence felt inside the cabin. The Ertiga is hands down a winner in this category. The Quanto has strong pricing on its side and that translates to it undercutting the Ertiga by as much as 1.53 lakhs in the top of the line variant (7.36 lakhs vs 8.89 lakhs) and a 1.9 lakhs difference in the entry level variants (Quanto C2 vs Ertiga LDI diesel). While that is lot of money we still don't feel that this price difference can make up for the better performance, efficiency and quality interiors of the Ertiga. Maruti have done a tremendous job with the Ertiga, it is a better package overall and without a doubt establishes itself as the benchmark for the class.